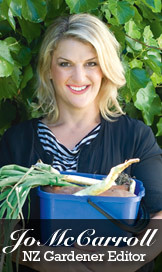 This page looks more like what the NZ gardener is all about: gardening. The other looks like just one more food magazine. Although I do think the bench may look better looking at it from more of a front-on angle. thanks for us the opprotunity to vote. 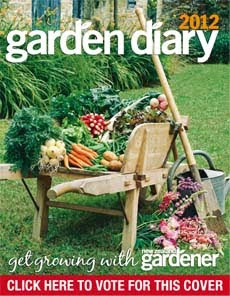 I like this cover, as it shows the garden as well as the harvested veges. A Barrow load of good garden food, says it all for the fruits of our labour. Gardening is very good and I love home back gardening very much. Having a photo of things in a garden is for growing and gardening. Having a basket of produce, is a cook book cover. I have had one of the garden diaries 2 years ago and it is a fantastic and easy to understand publcation and a must for all gardeners. All these veges from your own garden! All thses veges from your OWN garden! The cover on the L is preferable because it shows the veggies in the context of a garden. The veggies on the cover on the R could well have come from a supermarket, because they are displayed in a container on a bench or table. No proper context for growing your own here. I love this pic for the cover of the 2012 Diary...it is so "abundant"..yet so restful! this one is way more "homely"
Love this picture - it gives an overall picture of the garden while also giving an indication of all the hard work that goes into it! Love the wheelbarrow - my grandmother had one just like it! Love this cover, the other ones boring! The first cover with barrow shows both vegetables and flowers which covers all aspects of gardening. Just love the old wheelbarrow! Great photo, this is what every keen gardener has in his/her backyard yard. Looks like work and that is what gardening is. Pleasing work with a reward at the end. Perfect cover for the gardener. Love the content and the colours of the cover. very eye catching. This one connects me to my garden experiences a more lasting real feeling. The other pops at me more visually but I look at it and think someone could have just bought that stuff from the supermarket. That picture just makes me want to get out in the garden. The barrow looks like you have been around your garden gathering both veggies and flowers while tendering at the same time with the tools and watering can. Next year I vote for a picture of an urban farm! To enter plantings and harvests into a diary you are indeed a serious gardener.I love watching from one year to the next when successes occurred, or the odd failure and the remedy used at that moment. Real gardeners like to be shown gardens. Agree with what everyone else has said - the garden and wheelbarrow pictured together with freshly harvested produce sums up what it is to be a gardener! Like the homeliness of this photo rather than the other, the other looks a little clinical. And look at all those vegies... yum! The balance between the green lawn and produces in the wheelbarrow meaning work is well done and more inspirational for me than the basket of produces. I have been using the diary for the last 2 years and it is rather interesting to go back and read what we did in details. I'll definitely will get another one this year. Remind me when I was a kid(many years ago)My Dad was a great gardener & had a barrow just like that one & he could fill itno problem & then give most of it away to our neighbours. This one looks more in keeping with NZ Gardener magazine. Real homegrown veges, nothing posh. Love it! This photo puts it all into perspective...where the veges come from. I agree with one of the other comments. Yellow text on a white background is regarded as a big no no in the packaging business (as on the other cover) as it is totally unreadable from any distance. This barrowload cover is much better. Have after 5 weeks away in Morocco and Spain and it is so good to be home in the green green pastures of Home. Just getting my veg garden ready today and off to buy my goodies, just check your mag to see what I need before I go. Thanks a million for being YOU. Definitely the better option - all about a day in the garden. The clarity of the other cover is eye-catching... but too "seen that before advert-type picture"
I totally agree with all the other comments.This is so what gardening is all about. The picture sums it up - flowers, veggies, watering can, tools and that most essential "wheelbarrow". This picture makes me want to buy a diary, the other doesn't. The wheelbarrow suggests the work involved in gardening. The garden in the background shows the beauty of the environments some gardeners enjoy and others aspire to. And the veg in the barrow is our reward for our labours. The wheelbarrow and other tools suggest the work that gardeners do. The beauty of the background shows the environment some gardeners enjoy and others aspire to. And the veg in the barrow is our reward. Option Two looks like a box of veg from the supermarket. Ideal for the Get Growing Garden Diary cover Get This barrow of vegetables - is more suitable to me for "GET GROWING"
Veges, garden and flowers. Just what makes me get into the garden...all aspects of it!! I love this page as it's different to the usual but really says what the diary is about - the work and the reward.